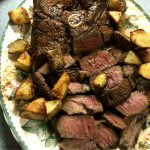 An easy way to make venison steak that is delicious and tender. Venison is a meat that is low in fat and cholesterol and high in vitamins. The meat is amazingly tender and tasty. Mix all the marinade ingredients together in a measuring cup. Place venison in a large zip lock bag. Pour marinade over steak and seal the bag. Place bag in a flat casserole dish so that the steak lies flat. Refrigerate and marinate at least 5 hours, turning every half hour to marinate each side. Drain the marinade at let the steak come to room temperature at least 1 hour. Spray grill grate with spray oil and heat the grill to 500 F.
Pat the steak dry with paper towels and then rub both sides of steak with olive oil. Lay the steak on the grill. Do not disturb for 2 minutes. With tongs pick up the steak and move it 90 degrees on the grill -- this will give you the cross-hatch grill marks. Grill another 2 minutes on the same side. Flip the steak and grill until medium rare, using the same method as the first side. Do the Finger test for doneness about 4 minutes. Move the steak to a platter and let it rest for at least 5 minutes. Slice the meat and serve. If using more meat, double or triple recipe accordingly.